The vessel RIVER DIGNITY with PLATOON in Tilbury on 5/6/89. RWJ ? The bulk carrier RIVER DIGNITY (22,361 tons gross, 38,309 deadweight) was owned by Golden River Co Ltd, of Liberia, which was a subsidiary of Sanko Steamship Co, of Japan. 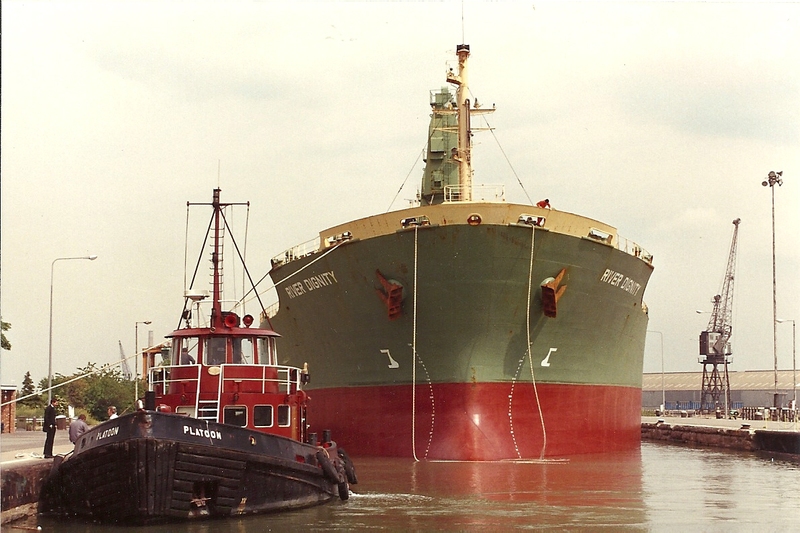 RIVER DIGNITY had started life in 1984 as SANKO DIGNITY under the Japanese flag and owned by Sanko Steamship. It was transferred and renamed RIVER DIGNITY in 1986. The bulker was sold in September 1993 to become the Liberian-flagged SEA BRILLIANCE and lasted until 2012, when it was broken up at Jiangyin, China.